We are wrapping up our first full inventory on Koha at Sump. I’m pleased to say it was much better than the process we had with Follett. I highly recommend doing an annual inventory and Koha makes it very easy to figure out what’s gone missing. Every time an item is scanned in Koha, the item’s “Last seen” date gets set. We will use the “Last seen” date in a SQL report exported to Excel to figure out what’s gone missing. There are three things you need to take inventory. A laptop computer, a barcode scanner and wireless Internet access. 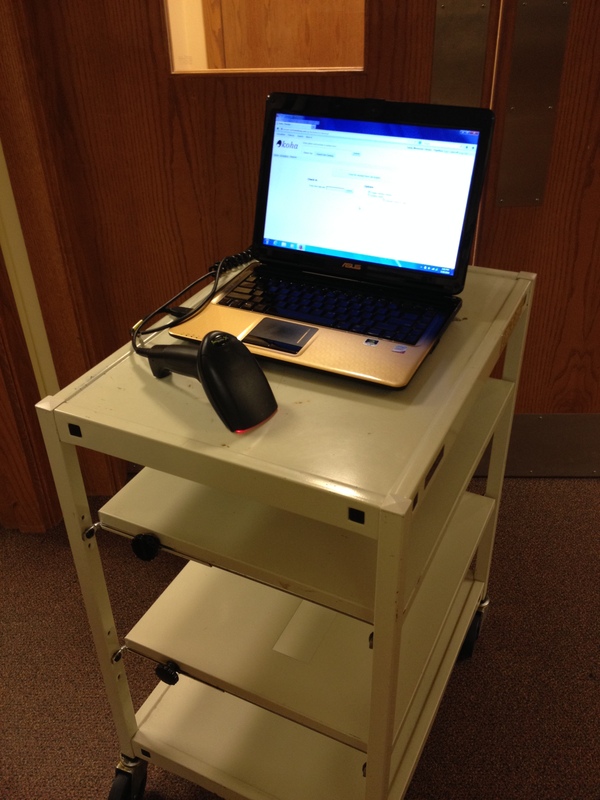 A cart for the laptop and an extension cord for charging it are very helpful too. (See picture.) If you don’t have a wifi network or laptop, you can cart the books by sections over to the Circ Desk to scan them. Log in to Koha on the laptop as Staff and go to the Check In screen. I recommend you check the “Forgive overdue charges” box before scanning any barcodes. This way a patron won’t be fined if you scan a book on the shelf that was still checked out. Have the laptop’s sound enabled. This will allow you track your scanning success by ear as you work your way down the shelves. It is also recommended that you scan the items by shelf-order to make it easier keep track of where you’re at. Make sure to record the date you start doing the inventory. We used a map of our library and a hi-lite marker to cross off what shelves had been scanned and when as we went along. As you scan, you should hear the beep from the scanner that the barcode was scanned successfully, see the “Not Checked Out” (NCO) message and hear the NCO double-tone warning on the laptop. If you don’t get the NCO message and tone, stop and see what’s up with the item you just scanned and take appropriate action for it. If the item has a Hold or was Lost you will get the tone for that and have to clear the Hold or Lost screen to be able to continue scanning. The items that have a Hold or were Lost can be placed on the cart for processing later. Once your inventory is completed, run the Std Item List report and export it to Excel (2010 version used for these instructions). To make the barcode column display the full 14-digit number, click on the top of the barcode column to select the entire column, click Format and Format Cells. Click Number, set decimal places to zero and click OK. Use Excel’s Data/Filter tool any clear any item rows with an onloan date or an itemlost code greater than zero. This will eliminate all the items that are checked out or already set to a Lost/Missing status. Next, sort by datelastseen and clear all the records with a date equal or greater to the day you started the inventory. The item rows remaining in the spreadsheet will be what may be missing. Sort the spreadsheet by ccode AND itemcallnumber AND author. This should give you a shelf-ordered list of items to go search for and validate. Any items located on this list should be scanned so their “Last seen” date gets set. And there you have it! Feel free to contact me if you need any assistance with this process. Previous Article Add a catalog search & hours to make your website better!